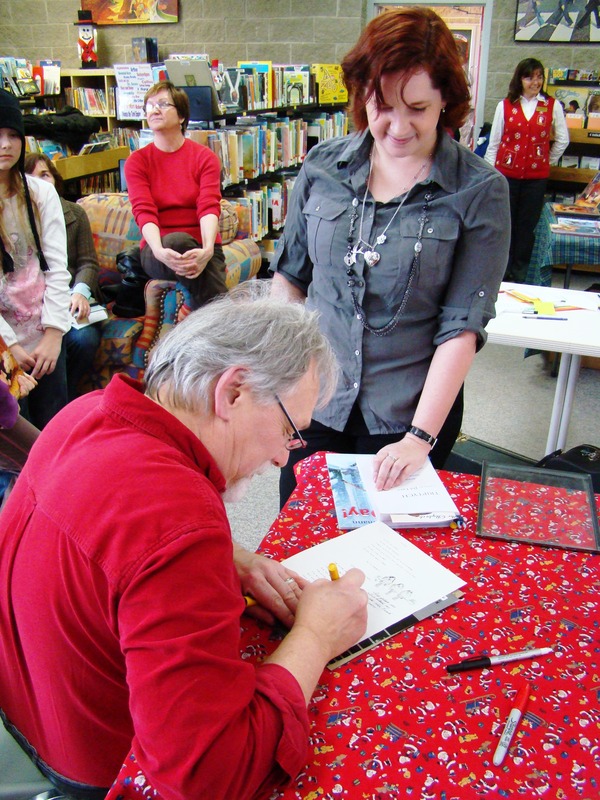 This past weekend I ambushed children’s author and illustrator Werner Zimmerman at a signing at the Fergus Public Library by asking him to sign something he made for me twenty years ago. In grade three, I had a best friend named Elizabeth, and we wrote a book of poetry. Elizabeth’s mother typed it up on the Commodore 64, and we gave copies to my parents, and to our teacher, Mrs. Graham. Mrs. Graham was a fantastic, encouraging teacher, the kind that really cares about the creative wellbeing of her students. (In fact, I ran into her in the grocery store a few months back and she was still very interested and invested in knowing what I have done with my life). Mrs. Graham made a bigger deal of the book than I ever expected a teacher to, even in retrospect. 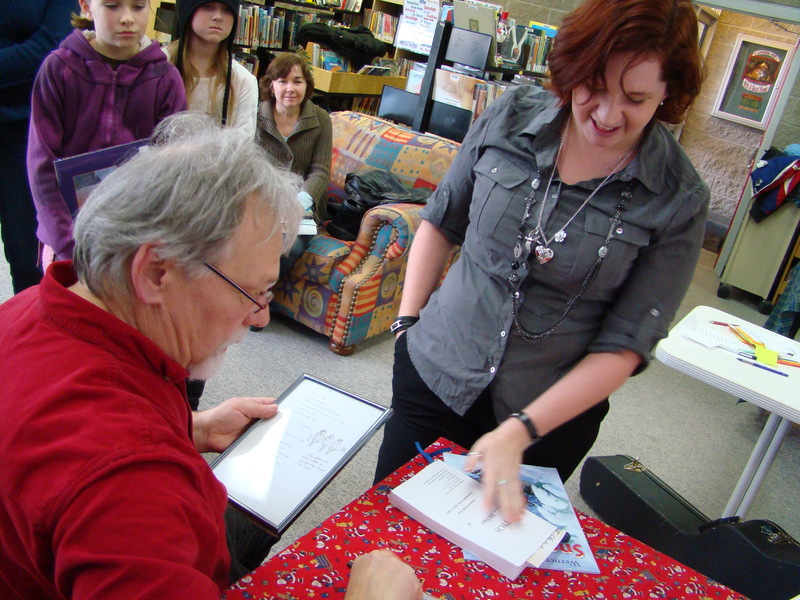 The class put on a presentation of the poems for the school, and when Werner Zimmerman came to do a school library talk, she gave him a copy of the book. Now, for those of you not in the know, a Werner Zimmerman talk can be a life changing experience for a kid. It was amazing to see this man in front of me, a man who had made a book, who had made lots of books. He showed us finger exercises for warming up before you write, and told us stories about the cat in the pictures and how she stole his chair in the studio every time he stood up, and about living in the neighboring town. He read us his Farmer Joe book, and showed us mock ups, practice sketches, and alternate covers for his picture books. Werner was inspiring to me because here was a real live author who lived near me. I thought authors were people who lived in castles in the Scottish highlands or the French quarter of New Orleans or cottages in Tokyo. I thought authors were like strange wild creatures that alight just long enough in our world to tell a story and vanish again. So to really meet an author, a man who got to tell stories for his job. … wow. I didn’t know that Mrs. Graham had given Werner Zimmerman the book until he came back a few weeks later to return it – covered in what he called “doodles”. What they really were was a collection of fabulous ink and watercolour illustrations of our poetry! Elizabeth and I were understandingly thrilled – we split up the pages between us, two original pages and two colour photocopies each – and mine were framed and hung in my bedroom. It was the first time anyone had ever shown that my writing was worthwhile. It was the first time anyone had believed in me and my work enough to put this kind of time in. It was amazing, especially for someone my age. Since then I have emailed Werner twice to let him know that I have the pictures still, and that they still inspire me as a writer. I took pictures of them on my walls to mail to him. Last Saturday, Werner Zimmerman was at the Fergus Public Library to celebrate the release of his new book “A Porcupine in a Pine Tree”, a Canadian version of the Twelve Days of Christmas. (I do enjoy that the Toronto Maple Leafs, who are a-leaping, never quite manage to get their hands on the five Stanley Cups). He showed us finger exercises for warming up before you write, and told us stories about the cat in the pictures and how she stole his chair in the studio every time he stood up, and about living in the neighboring town. He showed us mock ups, practice sketches, and alternate covers for his picture books. The kids all learned the song and there were actions and Werner played the guitar and it was recorded for the local news channel and to send to the troops overseas. A great time was had by all and I had a lot of fun standing in the back doing the actions and singing along. He looked at the picture in its frame – a trio of chickadees he had inked and painted on a page with poems about birds – and then his eyes bugged out a bit. “Wow, is this you? !” he asked, and immediately jumped up to give me a hug. You see, about thirty drafts ago, I was trying to describe the sky in chapter 1 and realized that the colour I had been trying to get into the reader’s head all along had been, of course, watermelon blue. September light dropped heavily over the stretching acreage of the farm, drenching the quiet world in the warm sepia of all the best nostalgia. The sky was the sort of open blue that prompted content, indulgent thoughts of a step-ladder and a spoon, just to see if it tasted as ripe as it looked. For a breathless second, even the birds and the insects seemed to share in the gentle glory of the early autumn sunrise, too awed to break the hush with the busy matter of attracting a mate. He smiled a lot and his eyes got a little wet as he read it, and then he signed a beautiful message under the chickadees for me. (I don’t have the picture with me as I write this, so I will come back and put in the proper inscription later, along with a photo of it). I thanked him, we chatted a little more, and then he had to move on to the next patient person behind me in line. Check out my silly grin. And the way my Mom is sitting in the background, trying not to look all proud and smiley.